The Story behind the HARVEY WALLBANGER for National Harvey Wallbanger Day! During the 1970s the Harvey Wallbanger was a very popular cocktail, pretty much a staple in most bars. In fact the drink was so popular in that era that in the 1972 presidential election "Harvey Wallbanger" garnered an impressive number of write in votes for president. Legend has it that the Harvey Wallbanger was invented by Donato "Duke" Antone for a regular customer, Harvey, who had just lost a surfing competition and needed consolation. The story goes that Harvey consoled himself so much that he was banging into walls by the end of the evening. The nickname he was given "Harvey the Wallbanger" stuck not only to him but to the cocktail that caused the trouble. True or not, it's a fun story and one to regale your drinking buddies with when the conversation lulls. 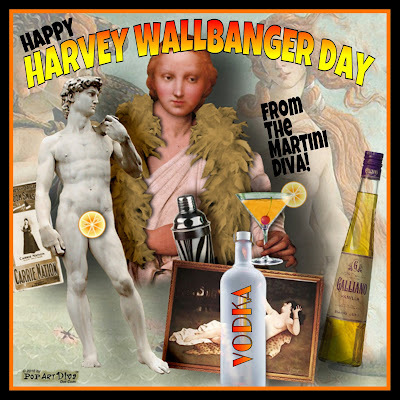 Happy National Harvey Wallbanger Day!